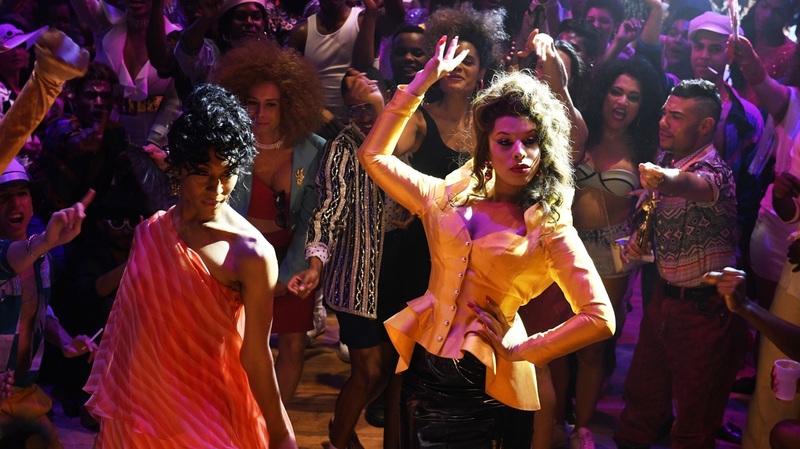 Ladies With An Attitude Make For A Striking 'Pose' Finale The first season wrapped up with a come-from-behind victory that surprised no one — but the appeal of the series isn't about who wins. The greatest thing about Pose is that it exists at all. In the POSE season finale, Blanca (Mj Rodriguez) and Lulu (Hailie Sahar) give good face-off. But so what. Because after all that, we'd get a scene at the ball. And Pose, the series which ended its first season Sunday night, would shrug off all those ungainly trappings, step into the spotlight, and shine. Those ballroom scenes, bursting with color and music and laughter and attitude, cast long, glittery, fabulous shadows over the scenes that preceded and followed them, enlivening the series with a sense of hard-won joy. Which of course is what Pose is about — the power of the disempowered to create something that is uniquely their own, and use it to make life more bearable. It's a how-to, of sorts: We watch members of a marginalized and threatened community channel the fear and outrage that mark their everyday lives into something fearless and invulnerable, beautiful — and fleeting. Some may carp that the series' conclusion — the triumph of noble and virtuous House Evangelista over villainous House Ferocity — was predictable. Those people have never seen a sports movie. Or a high school movie. Or a superhero movie. Or, it might be fair to say, a movie. Underdogs triumph, in storytelling. That's not predictable; that's inevitable. And this far into 2018, it's essential. Pose came to be when Ryan Murphy, who was developing a series about ball culture, and Steven Canals, who'd written a pilot script about a young dancer who moves to New York in the 80's and becomes a part of that community, decided to fuse their two visions. The result is uneven, but charmingly so. It would be glib to say you could tell a Murphy scene from the others by virtue of its campy excess — House Abundance swiping royal costumes from a museum, say, or stealing a Salvation Army bucket set to Darlene Love's "Christmas (Baby Please Come Home)," or Christopher Meloni taking off his shirt. It's true that the glitz and glamour and Meloni shirtlessness are fun to watch, but they're more than that. Because the story Pose tells, about a community of black and brown trans women and gay men in the midst of the AIDS epidemic, is urgent and heartbreaking and still too-little-known. The fun stuff — ball scenes, Meloni's torso, James Van Der Beek smarmily Gordon Geckoing up a storm, Dominique Jackson's Elektra regally reading someone for filth — aren't just the gloss, the spoonful of sugar. They're there to make the truer, grittier aspects of the series stand out in sharper relief. That a show like Pose (but of course there is no show like Pose, more's the pity) has found a berth on a platform like FX is heartening, as is the fact that it features trans women playing trans women. Apart from simply giving trans actors an opportunity too long denied them, it neatly removes a layer of artifice that clings to even a worthy show like Transparent, where a small, stubborn part of you can't keep from gauging Tambor's performance as you watch Maura's story. It also serves to underscore the show's pervasive sense of earnest sincerity, embodied most clearly in Mj Rodriguez's Blanca. The mother of House Evangelista got saddled with being the show's voice of reason and mercy and kindness and empathy — you know, the boring stuff. Rodriguez managed to keep Blanca from being a boring scold — mostly — by keying into the character's wounded quality. Dominique Jackson didn't lend Elektra much of an emotional range, though the script pushed her, at times too hard, to do so — but when she locked into attack mode, which was, you know ... often, she proved a haughty, hiss-worthy villain, with cheekbones that could slice manchego. Pose is of course a fictionalized version of '80s ballroom culture, but it references the real world. Season one's finale was set in the middle of 1988. So while it's likely the spine of next season will consist of another fight for the trophy between rival Houses, I'm hoping the series engages with the fact that two events — the 1990 release of Madonna's "Vogue" and, especially, Jennie Livington's 1991 documentary Paris is Burning -- are about to drag the insular world of these characters into mainstream awareness. The show has already shown a willingness to explore issues like transphobia within the queer community, so it will be fascinating to see how, or if, it tackles the subject of cultural appropriation. If I were taking bets, I'd say it will do so, and in ways that will often come off ham-fisted and broad. Some character — who are we kidding, it'll be Blanca — will deliver a heartfelt speech about exploitation, and it won't be done with any deftness or subtlety — but who cares.